Camellia sinensis is the plant which white tea, green tea, oolong and black tea are all harvested from. The difference between those teas lies in how the tea plant is processed. Other Common Names: Mecha, gyokura, bancha, kukicha, Asian tea, senchu, Chinese tea, Japanese tea. Habitat: China, Tibet, India, Assam, Cambodia and Japan. Plant Description: The tea plant is native to Southeast Asia; cultivated in tropical and subtropical altitudes from sea level to 7,000 feet. The plant is constantly pruned to a height of about 3 feet to encourage new growth. 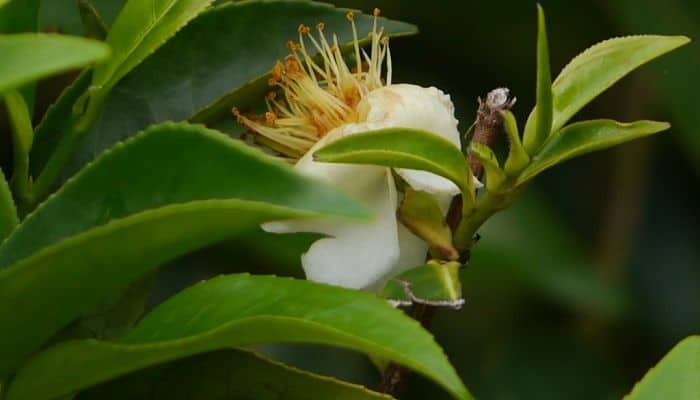 The tea plants produce abundant foliage, a yellow-white, camellia-like flower, approximately 2-4 cm in diameter, producing 7-8 petals and a berry. The growth of new shoots, called a flush, can occur every week at lower altitudes but takes several weeks at higher ones. It has a strong taproot and the seeds are pressed for oil. The leaves are from 3 to 14 cm in length and 2-5 cm in width, light green when young with short white hairs on the underside, becoming darker in maturity. The quality of the tea strength is determined on the age of the leaf with the youngest leaves and bud containing the most potency. Plant Parts Used: Leaves and flowers. The tea plant was first used as a food eaten for its medicinal effects, most often combined with onion and garlic; in Burma, many still eat pickled tea leaves. It is rich in catechins polyphenols, particularly epigallocatechin gallate (EGCG), a powerful anti-oxidant, reduces the risk of all cancers and inhibits the growth of cancer cells without harming healthy tissue. The use of tea can naturally lower total cholesterol levels, improves the ratio of good (HDL) cholesterol to bad (LDL) cholesterol. Green tea is used for weight loss because of its thermogenic properties that promote fat oxidation. The tea plant can be effective as an herbal treatment for rheumatoid arthritis, infection and impaired immune function associated with HIV. It effectively inhibits the abnormal formation of blood clots (thrombosis), the leading cause of heart attacks and stroke. EGCG is twice as powerful as resveratrol, the polyphenol found in red wine. The tea plant contains natural fluorine and the catechin glucosyl transferase which stops cavities, destroying the cariogenic bacteria that cause plaque and oral bacteria which produce bad breath. It has less caffeine than coffee; it refreshes the body particularly the central nervous system, skeletal muscles, heart, and liver. It restricts the increase of harmful forms of blood cholesterol; LDL and VLDL deposits on blood vessels walls lead to atherosclerosis, which in conjunction with high blood pressure can cause myocardial infarction and cerebral infarction. Green tea helps maintain the necessary balance between HDL healthy cholesterol and LDL. Tea impedes the activity of Angiotensin Converting Enzyme (ACE) which converts the chemical angiotensin I to angiotensin II, an extremely strong vascular constrictor, leading to high blood pressure overloading the vascular system and contributing to atherosclerosis, which precipitates heart disease and stroke. 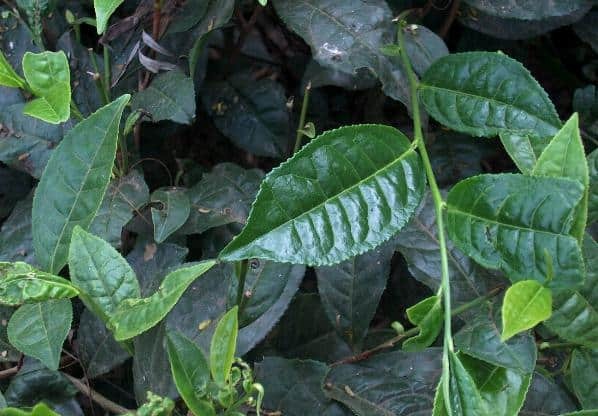 The tea plant is effective in lowering the blood sugar levels. High concentrations of blood sugar affect the vascular system and can lead to atherosclerosis and retinal hemorrhages. It reduces inflammation associated with Crohn’s disease and ulcerative colitis, the two types of Inflammatory Bowel Disease (IBD). Tea protects the liver from the damaging effects of toxic substances such as alcohol, including viral inflammation of the liver (hepatitis). The level of polyphenols in tea will vary depending on the brand. Decoction: 2-3 cups per day or a total of 240 to 320 mg polyphenols. Tincture: 300 to 400 mg per day of standardized green tea extract. 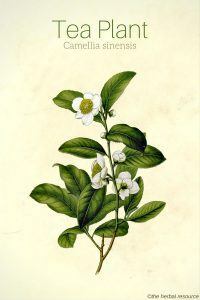 Tea and tea extract contain caffeine. Caffeine can cause insomnia, anxiety, irritability, upset stomach, nausea or frequent urination in some people. In extremely high doses, caffeine can raise blood pressure, cause seizures, delirium, or irregular heart rhythms. Adenosine: Inhibition of activity of this medication administered for an unstable heart rhythm. Aspirin: Combined with aspirin can increase your risk of bleeding. Benzodiazepines: Reduced effectiveness of anxiety drugs diazepam and lorazepam. Beta-blockers, propranolol and metoprolol: Impaired effectiveness of this high blood pressure medication. Blood thinning medications: The vitamin K renders medications such as Warfarin ineffective. Chemotherapy: Stimulation of a gene in prostate cancer cells, causing them to be less sensitive to chemotherapy drugs. Clozapine: Reduced the anti-psychotic effects. Ephedrine. May cause agitation, tremors, insomnia, and weight loss. Lithium: Reduction of the blood levels of this manic depression medication. Phenelzine, Tranylcypromine: An increase in blood pressure or “hypertensive crisis” can result. Oral contraceptives: The amount of time the caffeine content of green tea stays in the body is increased. Phenylpropanolamine: Used in over-the-counter and prescription cold medications and weight loss products, in combination can cause mania and a severe increase in blood pressure.